This map is a DesertB18 varient with AI Bots - Covenant Elite (Blue) vs. Spartans and Marines (Red). 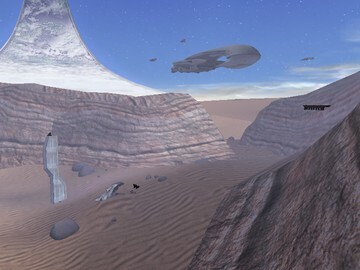 Spartan and Covenant forces have joined together in a very shaky alliance to rid the desert enclave of a Flood infestation. A Marine outpost is under attack by the Flood, and have alerted a team of Spartans located at a nearby base (Red) for support. The Covenant base (Blue) is heavily defended by Elite Needlers. Many modifications have been made to the original map for scenery, weapons and vehicles. Spartans leave their base in three Leopard Scorpions and on foot to repel Flood attacking a Marine outpost. AI operate a turret gun at each base for defense. Elite pilot three Banshees from a cliffside for airborne attacks against the Flood, but will turn on you if they happen upon you on their way to the fight. Two Fr_Ghosts are driven to battle by Elite. Marines will hop in on your DPV or Scorpion for a ride, and a Spartan guarding the Pelican base will hop in and fire the rear gatling gun, however, you can operate the gun remotely if there is no gunner. There are several secret portals that will transport you to normally inaccessable areas of the map where a powerful UNSC Portable Nuke can be found. Hint: they are at ground level. This mod is designed primarily for solo play, where you can play as either team. 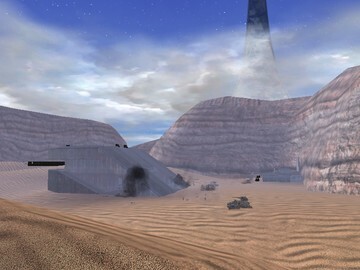 Other players can try and join the battle on the Red Team (Spartans) or change to Blue Team (Covenant) to battle the Flood, but they may encounter extreme lag or even exception errors. Always remember, no AI characters will sync in HALO CE multiplayer.